Gougane Barra Hotel: lakeside, really lakeside gougane barra hotel. lakeside, really lakeside gougane barra hotel. Cast out from your window and hook an early morning trout for breakfast, but there's no trout when the lake is this calm. 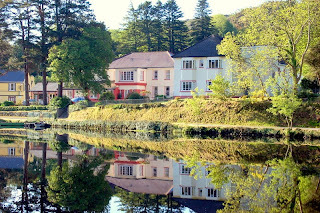 Labels: lakeside, really lakeside gougane barra hotel. Rolls Royce Touring Club came to lunch..
is situated in a uniquely magical unspoilt lakeside location in the mountains of West Cork in the South West of Ireland. Neil and Katy’s 26 bedroom family run, seasonal hotel is renowned for its genuine old-fashioned hospitality, has a reputation for really good food, has a cosy friendly bar, and relaxing sitting rooms overlooking the lake and mountains. We have bikes and rowing boats and are just 1 kilometre from the Coillte National Forest Park. We would be happy to help you plan any specialised break with the help of an experienced energetic team. The church in Gougane Barra ( St. Finbarr’s Oratory) is a famous wedding venue, and is just a short walk from the hotel, we also specialise in small intimate weddings and also have civil ceremonies in the hotel. Whatever your reason is to visit Gougane Barra we can help you to make it a memorable one.